Fantastic job getting so many photos on the LO without it looking cluttered! I love how you added so many sweet elements and used the word strips. What a neat thing to have a back to school party!! I love how you were able to incorporate so many photos all around this page, without it being overwhelming! Oh wow, I LOVE that you've used so many photos yet the page doesn't feel full at all. You rocked this page so much! Awesome circle design around your title and journaling. Wonderful page celebrating the first day! What an awesome idea! Sounds like a great party - and you have an awesome series of pictures to document it! Very nicely done! This is such a great page!! Oh my gosh, just the cutest photos all over the page to look at! 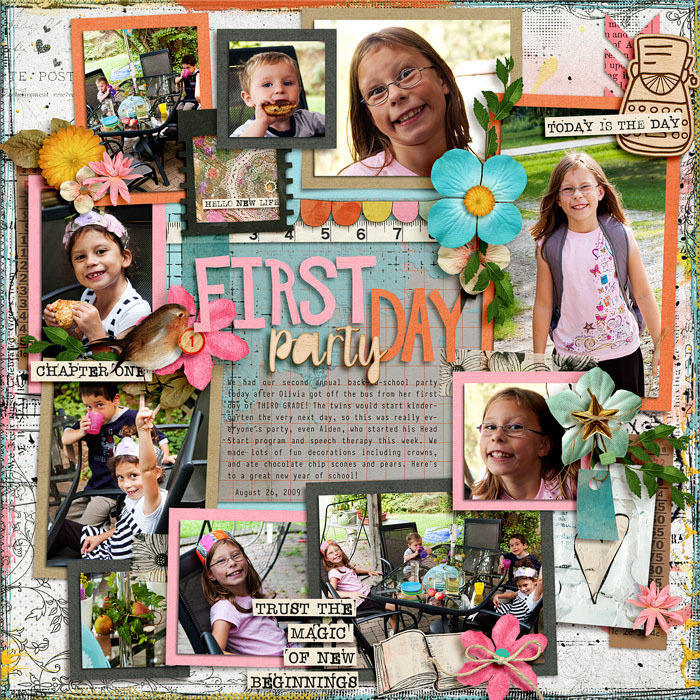 Totally fabulous page, I love these cute photos and gorgeous clustering! Perfect layout. I love your layouts where there's so much to see and so much to explore. Love the story and all the photos.